Don’t confuse all this talk about reporting and analysis. Despite what a lot of people will tell you, they are completely different processes. Reporting comes first: it communicates results. Reporting shows us the “what,” such as changes in data. Analysis addresses the “what” and seeks answers to the “whys,” such as root causes of change. 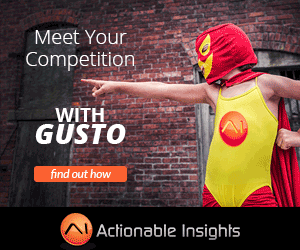 Actionable insights are arrived at when reports trigger questions and analysis answers them. 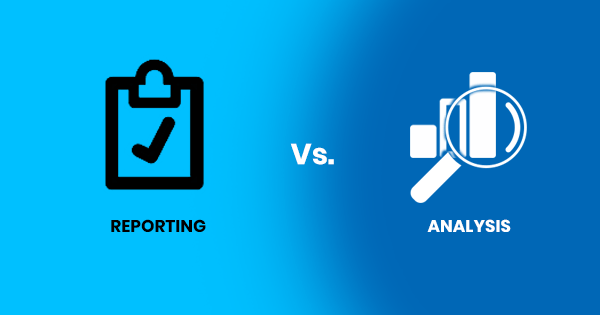 Reporting can be accomplished in a vacuum – just a comparison of numbers — but it’s useless without more information on what the data signifies and how findings can lead to strategy improvement. It’s the analysis that gives purpose to the reporting. To create a symbiosis between analysis and reporting, we first need to identify our goals; this is the “who cares” part of the equation. We’ll get nowhere by just looking at data and hoping an actionable insight will pop out at us. We suggest our clients start with targeted goals and questions they’d like answered before we even start the reporting process – why waste time and money on pointless charts and graphs? Be assured, it’s crucial that we always have questions prepared for the analysis process. We need to know our goals before we can analyze data and dig up answers. So many so-called “actionable insights” providers forget this: They give you a screenshot of what’s happening, but unless you can piece together sources for the situation, the information isn’t very helpful. Insights aren’t enough, remember? They must be actionable insights. Let’s say we decide to review margin trend data from the past year for your product. The reports show us the peaks and valleys, but we can’t possibly know the reasons for them. If we start with uncovering those reasons to approach the “why,” we’ll uncover the actionable insights needed to improve our strategy. If our strategy to make our data useful is merely reporting, we’re wasting our time and yours. We take our data to its full potential by driving profitable change and improvement during the analysis process. And the proof of that pudding is on the bottom line.